Colonial Life defines voluntary benefits as “supplemental insurance… offered by the employer through the workplace where employees can choose to buy them in addition to the core employee benefits they may get as part of a benefits package.” These voluntary benefits are becoming more of an expected part of a comprehensive benefits package. 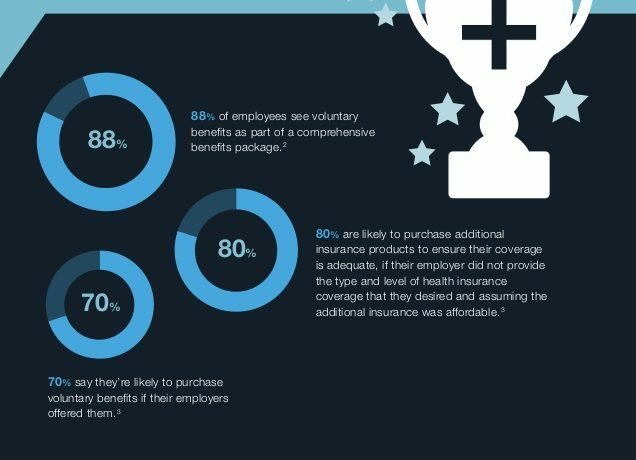 Of the employees surveyed in a 2015 AFLAC Workforces Report, 88 percent said that they view voluntary benefits as part of a comprehensive benefits package. Below are a few reasons why we believe voluntary benefits can be beneficial. In an Entrepreneur.com article, titled Employee Demand Makes Voluntary Benefits Mandatory for Employers, benefits are said to relieve financial pressures leading to happier employees with lower levels of work-related stresses. When asked what the top non-work related issue is that distracts employees from work, one of the top answers is personal finance. Among those surveyed by AFLAC, those whose employers offered them voluntary benefits, were less likely to list personal financial issues. The biggest plus for both employers and employees, is that payment options are typically flexible. Employers can choose how they want to offer these benefits and can even offer voluntary benefits at no direct cost to them and yet allowing them to gain a high level of competitive advantage over other similar companies that do not offer similar benefit options. According to another study by Quantum Workplace, more than 76 percent of engaged employees said they were “satisfied with the health and wellbeing benefits their employer provided, compared with less than 49 percent of hostile employees.” As is the trend in the employment field, offering loyalty programs seem to be doing what they set out to do – produce a more loyal workforce. As with most relationships, knowing that you are cared for, provides a further incentive to stay and become more engaged. Benefits can work the same way. For more information on how to offer Voluntary Benefit Solutions, get a quote with ERG today.